Cyrus Miller runs a circus that features fun houses, trapeze acts, and even a terrifying gorilla named Goliath. When a disgruntled worker ends up dead and impaled on the fence where Goliath performs, it seems certain that the gorilla got lose, but Cyrus and any number of people have motives for the killing. Is it Joey (Cameron Mitchell), the carnival barker? Could it be Laverne (Anne Bancroft) the trapeze artist? What about Cyrus (Raymond Burr) himself, this isn't the first death that has been laid at his feet. More bodies start appearing, and Goliath gets loose, but is he really the killer? Gorilla at Large isn’t a horror movie, although it does contain elements of horror. 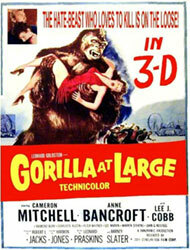 At the core it is a mystery with a killer gorilla as the prime suspect. If you go into this movie expecting ape mayhem you are going to be disappointed, like most mysteries it is a lot of talking with the occasional reveal of a dead body to push the story along. This is not a fast-paced film, even at only 84 minutes long it feels like it is much longer. "Anyone know if this place has a gorilla?" This film was originally shot for 3-D and in Technicolor, so it features bright eye-popping colors and some dynamic compositions. The 3-D usage is much more naturalistic than most films and doesn’t resort to characters awkwardly shoving things into the camera. There are few trapeze scenes that go on too long, but for the most part, the gimmickry is reserved. For a movie called Gorilla at Large, the gorilla suit isn’t very impressive. Due to the 3-D needing a clearly defined image, Goliath is usually very brightly lit which doesn’t help at all. 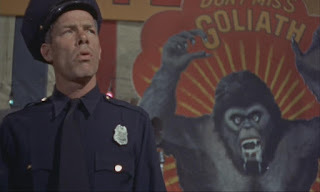 The actor inside, George Barrows is a gorilla suit veteran (you may know him better as Ro-Man from Robot Monster (1953)) and his body language and the way he emotes through his eyes really give Goliath some character. He’s bestial, but also innocent, which leads to a tragic 3rd act where something as simple as fireworks are the key to his downfall. One of my favorite sequences is when Goliath is lost in the fairgrounds and bewildered by the constant barrage of noise and lights from the rides and the attractions. "Ooh this is doing wonders for my back." Gorilla at Large sports a surprisingly good cast including Raymond Burr, Anne Bancroft, Cameron Mitchell, Lee J. Cobb and Lee Marvin. With all these talented actors, Gorilla at Large steps up from what would have been just another potboiler mystery and becomes much more of a character piece. The mystery hinges on virtually everyone being a suspect and having characters with more depth works to make that successful. 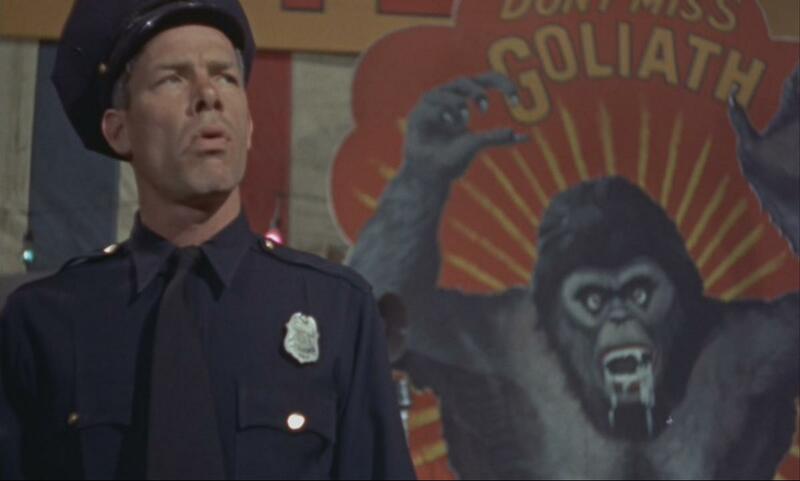 Gorilla at Large is a serviceable mystery with an enjoyable setting and a decent cast. It is held back by sluggish pacing, but it has some great acting and visuals that make it worth checking out at least once. The version I saw was 2-D, but I think this is a film that is greatly enhanced by a 3-D presentation where the spectacle of the film would be helpful in easing the story issues. Still, Gorilla at Large gives us a look at what makes a monster out of people and animal alike.